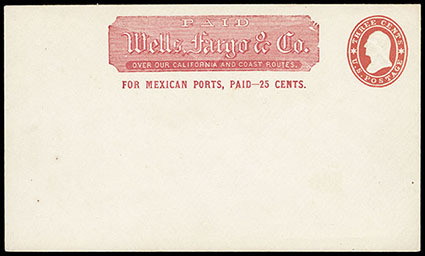 Western Express Covers - Wells Fargo & Co.
Wells Fargo & Co. 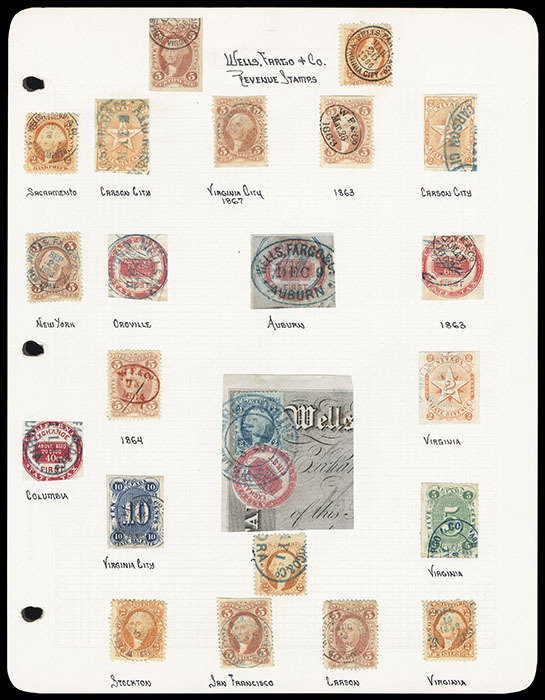 Cancellations on Revenue Stamps, 1863-67, collection mounted on two pages containing a variety of handstamped cancellations on a wide variety of revenue stamps including 2¢ and 5¢ revenues, 2¢ and 10¢ Nevada State Tax, California State Tax, Wells Fargo blue oval handstamps include Auburn, Columbia and Carson City, small oval datestamps, and double-circle datestamps from Carson, Sacramento, Virginia Nev., Virginia City, San Francisco, Stockton, and small "W.F. & Co." month and year ovals in red, blue and black, F.-V.F. and interesting collection. 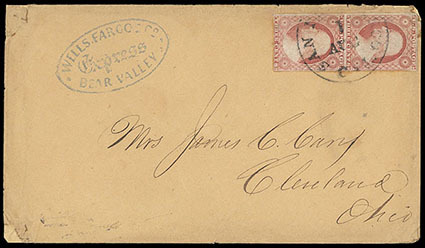 Wells, Fargo & Co. Express, Bear Valley, blue oval handstamp on cover to Cleveland franked with 1851 3¢ dull red, vert. 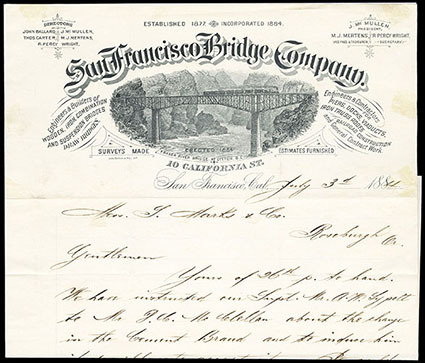 pair tied by San Francisco cds, cover with corner defects, Very Fine. 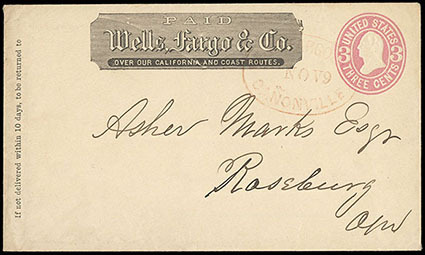 Wells, Fargo & Co., Cañonville, Nov. 9, Spanish spelling in red oval handstamp on 3¢ pink entire to Roseburg with black company frank at top, Very Fine. 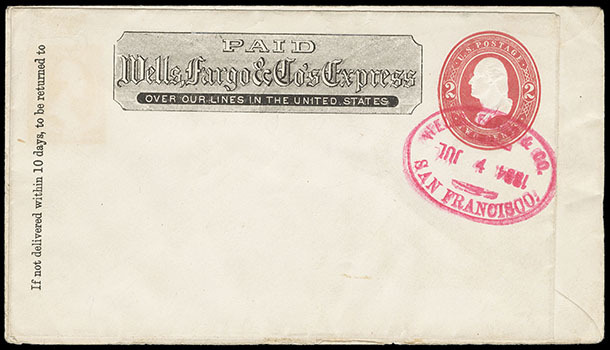 Wells, Fargo & Co's Express, From Columbia, town name handstamped on orange label affixed to 3¢ pink entire with black company frank to San Francisco, with manuscript notation "$10 pd", docket "July '65", Very Fine, ex-Lichtenstein. 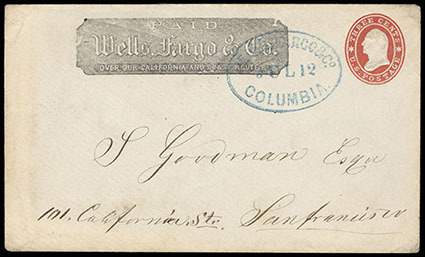 Wells, Fargo & Co., Columbia, Jul. 12, blue oval handstamp on 3¢ Star Die entire to San Francisco with black company frank at top, flap torn, Extremely Fine and attractive. 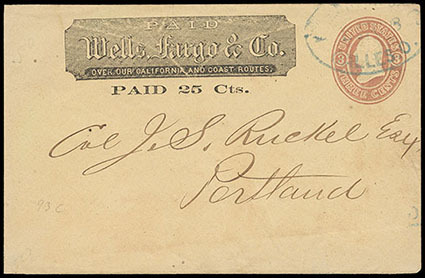 Wells, Fargo & Co., Dalles, O., blue oval handstamp on 3¢ pink entire with black company frank to Portland with "Paid 25 Cts." 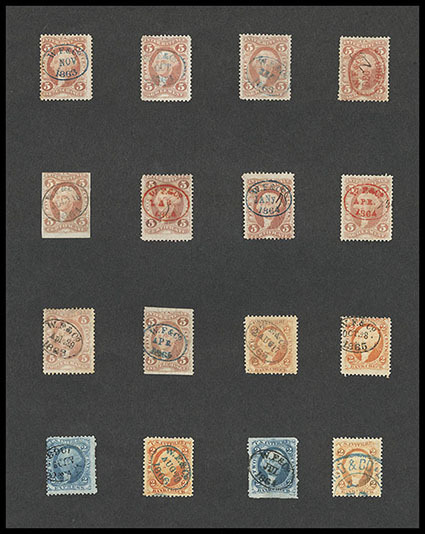 printed surcharge below frank, slightly reduced at left, F.-V.F., a rare surcharged frank. Wells, Fargo & Co., For Mexican Ports, Paid - 25 Cents., red company frank on unused 1860 3¢ red on white Star Die entire, Very Fine, an extremely rare frank believed to be an essay as no used examples are known, we know of only two other examples of this frank, one on a 1860 3¢ red on buff Star Die entire (U27) and on a 1864 3¢ pink on white entire (U58), each of these are believed to be unique. Scott No. U26 Estimate $200 - 300. 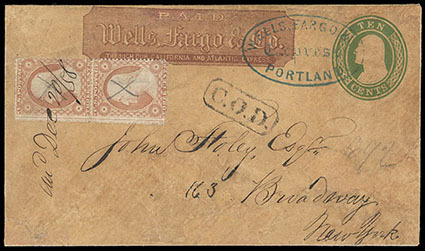 Wells, Fargo & Co. Express, Portland, blue oval handstamp on 1853-55 10¢ Nesbitt entire with red company frank addressed to New York, additionally franked with vert pair of 1857 3¢ dull red, pair cancelled by pencil "X" and manuscript 1858 docketing, boxed "C.O.D." handstamp of Metropolitan Express applied on arrival in New York for local delivery, cover cleaned & repaired, Fine. 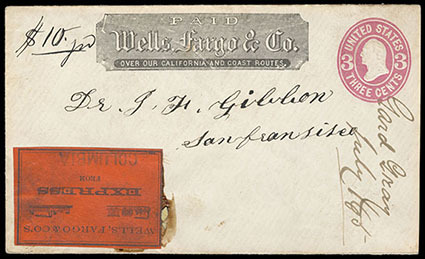 Wells, Fargo & Co., San Francisco, Jul. 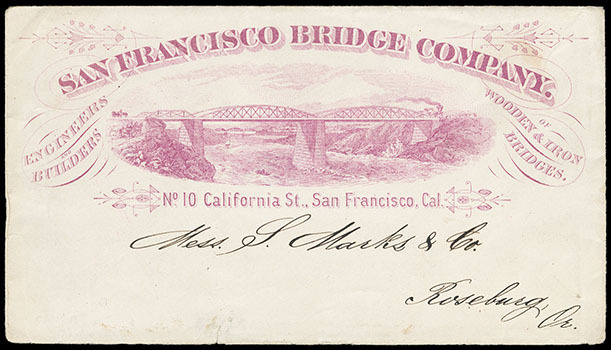 4, 1884, magenta oval handstamp on 2¢ red entire with company frank used as a paste-up, reverse addressed to Roseburg, Ore. and with spectacular printed illustrated advertising of the "San Francisco Bridge Company" in light purple, included is matching original enclosure, Extremely Fine, a stunning item. 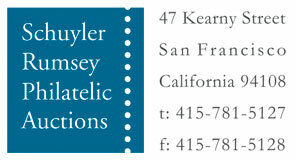 Wells, Fargo & Co., San Francisco, Mar. 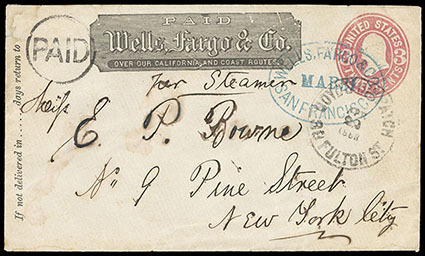 31, perfect strike of blue oval handstamp on 3¢ pink entire with black company frank addressed to New York City with Boyd's Dispatch, Apr. 22, 1863, 38 Fulton St. circular handstamp with matching "Paid" in circle for local street delivery, flap added, Very Fine and attractive.